(Bloomberg) -- Oracle Corp. executive Thomas Kurian’s leave of absence, disclosed last week, stemmed from differences with co-founder Larry Ellison over the software maker’s cloud business, according to people familiar with the matter. The growing strife between Kurian, president of product development, and Executive Chairman Ellison culminated in Kurian’s announcement on Sept. 5 that he’s taking a break, said the people, who asked not to be identified discussing a private matter. Kurian wants Oracle to make more of its software available to run on public clouds from chief rivals Amazon.com Inc. and Microsoft Corp. as a way to diversify from its own struggling infrastructure, a view opposed by Ellison, one of the people said. Kurian, 51, has spent 22 years at the world’s second-largest software company, playing a key role in its product management and development. He reports directly to Ellison, while Chief Executive Officers Safra Catz and Mark Hurd report to Oracle’s board, led by Ellison. Kurian climbed through the ranks of the Redwood City, California-based company by spearheading products that accelerated sales growth. But it’s been a tougher slog in infrastructure, the base layer of cloud computing and storage services, where Oracle hasn’t gained much traction against Amazon Web Services and Microsoft’s Azure. Despite years of collaboration between Ellison, 74, and Kurian, both are strong-willed and at times have clashed, said one of the people. During Kurian’s leave of absence, the company’s infrastructure unit will report directly to Ellison, the person said -- signaling that Oracle may not be expecting a swift return. The overall product organization that Kurian oversees includes 35,000 engineers spread around the world, and has been responsible for products that generate $35 billion of the company’s annual revenue, according to Kurian’s LinkedIn page. Oracle did not respond to requests for comment. Kurian declined to comment. A spokeswoman for the company said last week that Kurian was taking “some time off” and she expected him to return soon, without specifying the cause or projected duration of his temporary leave. 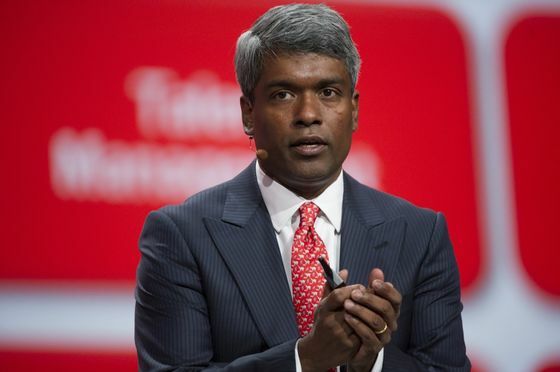 Kurian’s chief responsibility has been to transition Oracle’s traditional software -- which usually sits on corporate clients’ own servers -- to the cloud-computing age. The shift has disappointed investors, who thought the 41-year-old company would have an easier time moving customers to products and services accessible through the web. Oracle has been spending on new data centers and making acquisitions to support the cloud overhaul, but Wall Street has grown concerned about lackluster growth in cloud revenue. The company’s shares have declined about 7 percent in the past year, compared with a 16 percent gain in the Standard & Poor’s 500 Index. They were up less than one percent Wednesday, closing at $49.34. Making more of Oracle’s software available on competitors’ clouds would create opportunities to sell to customers that are already up and running on Amazon or Microsoft’s platforms, which dominate the market for web-based infrastructure. AWS revenue climbed 43 percent last year to $17.5 billion as a growing number of corporations adopt the service. On the other hand, Ellison has publicly knocked the quality of Amazon’s cloud products. Expanding Oracle’s compatibility with AWS and Azure, which can already run a limited number of Oracle apps and databases, would validate the rival services and undermine the company’s argument that Oracle’s own cloud is the best home for its software. “We support the notion of increasing Oracle support for other clouds,” Brad Reback, an analyst at Stifel Nicolaus & Co., wrote in a note on Wednesday. “Given the lack of meaningful capex investments and limited traction to-date, we are not convinced Oracle can catch up with” Amazon, Microsoft and Google, he wrote. Kurian received a compensation package worth almost $36 million last year, according to regulatory filings. He doesn’t have an employment contract at Oracle and won’t receive severance if he quits or is fired. He currently holds unvested equity awards worth at least $40 million, filings show.